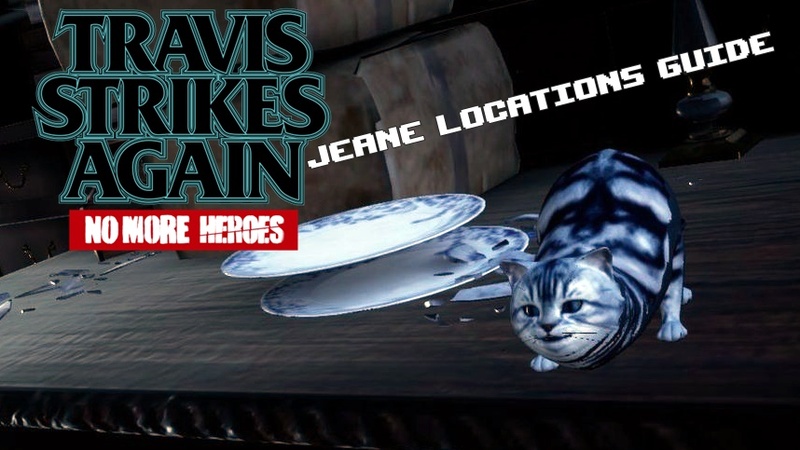 In Travis Strikes Again: No More Heroes, After completing some of the Death Balls games, you will recieve a fax from Jeane the talking cat. Jeane will tell you that she is trapped in one of the games and asks for you to rescue her. She also gives you a cryptic clue as to her wherabouts. Some of her clues can be very little help at all but fortunately we have you covered with our Travis Strikes Again Jeane Locations Guide. Rescuing Jeane in all five locations will net you a special Skill Chip that can turn you invisible for a short amount of time or until you attack. The Ξ skill chip can only be rewarded after finding Jeane so if you want to get your hands on it, we better get cracking. Just one thing before we start. When you are getting close to Jeane’s location, you will start to hear her Meows. This lets you know you are heading in the right direction. Her faxes to you will appear after beating a particular level and only after rescuing her from the previous location. When you complete Life Is Destroy, You will recieve a fax from Jean saying that she is in Electro Thunder Tiger II. To find Jeane, there are two routes. The quick and painful or the slow and agonizing. The Slow and agonizing route has you load to Toilet #001_02. You will need to make your way into the factory and have quite a lot of bug battles to get through. Jeane is inside the Factory on one of the higher platforms just past the string of exploding Bug Gates. She will be lying next to Bugxtra. The Quick and painful route is by loading up to Toilet #001_03. Backtrack over the electrocuting platforms which you will get shocked on (a lot!) until you reach the pathway with the Bug Gates. Continue south to reach Bugxtra and Jeane. After the completion of Coffee & Doughnuts, You will recieve a fax from Jeane to say she is in Life Is Destroy. To find Jean here is much easier than in Electro Thunder Tiger II. Simply load to Toilet #002_05 and search the Northeastern room of the house which is directly above the bathroom. There will be no enemies to fight so you won’t have to waste time trying to get to Jeane. Once you beat Golden Dragon GP, Jeane will send you another fax. This time she is stuck in the game Coffee & Doughnuts. This is another relatively easy location to find. There is only one toilet in the mansion so you will automatically arrive in the main hall of the house instead. All you need to do is go to the fourth floor using the elevators on the second floor to the third and then the third floor elevator to reach the fourth floor. Jeane is hiding in room #404. She will be lying on the table. When you have finished Killer Marathon, Jeane will send another Fax to say she is stuck in Golden Dragon GP. This one is a doozy because Jeane is stuck on the 64th floor of the Dragon Tower. The floors are randomly generated and there is only one way to get to Jeane. Load up the game and go to the 64th floor. In the very first room, there will be a set of coins in front of the door (1,2,3,4). You will need the door that has three coins in a diagonal line. If you don’t get it, return to the trailer and load Golden Dragon GP up again. Repeat this process until you do eventually get the three coins in a line. When you get the three coin path, go up the corridor until you enter a large room. Fight all the bugs in here and then enter the door in the top left corner. Go through the corridor and into the next room. Clear it out of all the bugs and instead of carrying on north, a door in the Lower left corner will open up as well. Go through there and you will reach a room full of coins and an Azteca Stone. Jeane is hidden by the wall on the southern on the bottom of the screen. head to the center of the wall and Jeane’s name will pop up. Press A to get your kitty. You will recieve a fax from Jeane right after beating Serious Moonlight. She is in one of the most easiest locations to find but… and its a big But, you have to fight through hordes of enemies to get there. Jeane is located in the courtyard just after the Ramen Stall next to the large fountain. This is just before the last Toilet leading up to the boss fight but you can’t backtrack from Toilet #006_04. Instead, you have to load up from Toilet #006_03 and work your way up, that includes getting the three Mock Strawberries in the marketplace maze. Once you finally reach the Courtyard after the fountain, you will have one more bug battle and once the room is clear, an alcove in the top left corner of the map will be accessible along with the very familiar Jeane. This is the final Jeane location, after reaching her here, she will reward you with the Ξ skill chip. We hope you found this guide useful. If it was of any help, feel free to let us know in the comments below.